Freecharge – Get Rs 100 Cashback on Recharge or Bill Payment of Rs 100 or above. 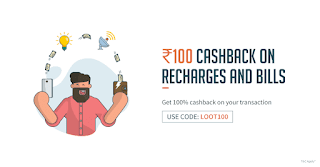 Freecharge has come up with an Exclusive offer for Freecharge users in which you will get Rs 100 cashback on minimum Recharge or Bill Payment of Rs 100. This Offer is an Account Specific So it will work only for those who have received email/sms regarding this offer, So hurry up and avail this offer !! 2) Install and open the Freecharge App. 3) Login / Sign up to your account. 4) Initiate a Mobile Recharge or Bill Payment of Rs 100 or more. COLOR75 – Get flat Rs. 75 cb on recharge of Rs. 100 or above. 6) Once your coupon is applied successfully then complete the transaction. 7) You will get the Cashback of Rs 100 and will be added to your account within 24 hours. 3) HOLI100 Promocode has to be applied to avail cashback offer. 5) Cashback to be offered in the form of EGV which can be redeemed in the next 6 months. 6) Not valid on transactions done via FreeCharge Balance and Netbanking. 7) Offer not valid for Airtel transactions. 8) Offer valid on FreeCharge App, Web & mWeb.